Neil deGrasse Tyson says the supposed UFO video released by former Blink-182 guitarist Tom DeLonge is garbage. Yesterday, in an appearance on CNN’s New Day America's favorite astrophysicist tore the video to shreds. DeLonge and former Pentagon official Luis Elizondo released the video titled "Gimbal" by "To The Stars Academy of Arts & Science", which was founded by the guitarist. Elizondo spent years researching Unidentified Flying Objects on the Pentagon's Advanced Aviation Threat Identification Program. That program began in 2007 and ended in 2012. The video was reportedly taken by pilots and appears to show a UFO moving mysteriously and the pilots reacting in amazement. "If you're asking my personal opinion from here, look, I've got to be honest with you, I don't know where it's from. But we're pretty sure it's not here," Elizondo says. "Now does that mean it's 'out there'? Whether or not it's Russian or Chinese inside or little green men from Mars or frankly your neighbor's dog, I wanted to purposely steer away from that because I wanted to focus on truly the raw science: What were we seeing and did it pose a threat to national security?" The video went viral and was covered by sites like The New York Times, NPR, and Politico. Neil deGrasse Tyson isn’t impressed. He pointed out that the term "Unidentified Flying Object" means Unidentified. Flying. Object. "The universe brims with mysteries," deGrasse Tyson said. "Just because you don't know what it is you're looking at. Doesn't mean it's intelligent aliens visiting from another planet!" He points out that scientists deal with lack of knowledge every day. "Keep checking it out. Call me when you have a dinner invite from an alien," Dr. Tyson says. "The evidence is so paltry for aliens to visit Earth, I have no further interest." He adds, "Let other people who care go ahead, and then when you finally find some aliens bring them into Times Square." While he’s skeptical he doesn’t say the millions spent in research is wasted. "I’m glad the Pentagon was looking at this because if it posed a threat, I want them on top of it right away. The program is closed down, which said 'not a threat.'" With all the high powered cameras available in the world, he says we can do better than that for proof of aliens. Tyrion’s skepticism of extraterrestrials coming to earth and phoning home was broken down in a Reddit AMA earlier this year. He was asked, "Do you think we will ever make contact with complex organisms within the next 50yrs?" He said, "No. I think they (we) might all be too far away from one another in space and possibly time. By complex, I'm presuming you mean life other than single-celled organisms. Life with legs, arms, thoughts, etc. It's all about our capacity to travel interstellar distances. And that's surely not happening in the next 50 years. Not the rate things are going today. 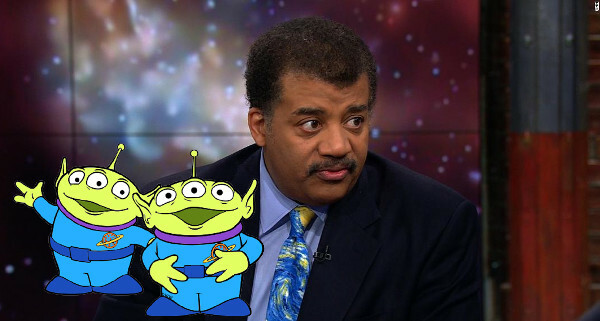 -NDTyson"
If aliens ever do show up at Times Square Tyson will be the first person in line to shake their hand. Or whatever aliens shake. Till then he’s not impressed by your blurry YouTube videos. Is he right? Does the Gimbal video prove intelligent life exists in the universe?